I am still in search of the perfect trail shoe. 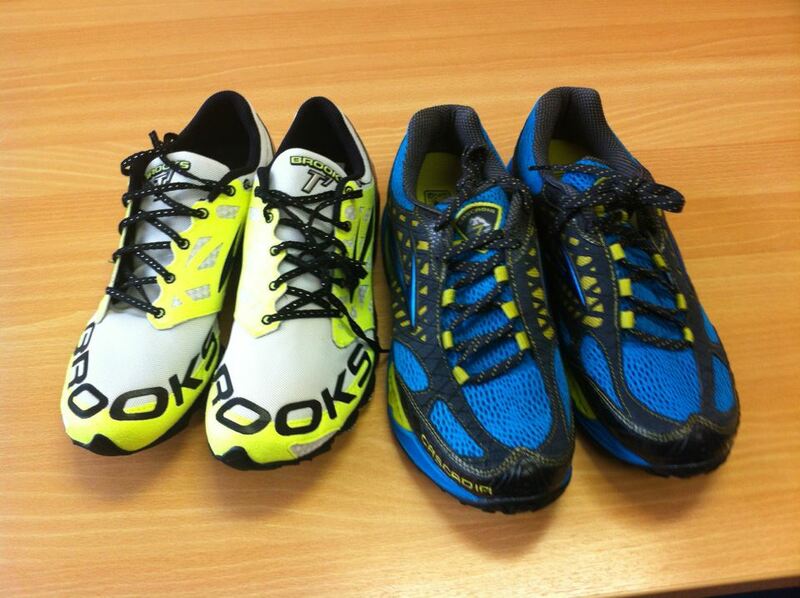 I love my Brooks Pure Grit, but on long treks over sharp stones you soon start to feel the pressure on your foot. I have been on the lookout for something more substantial which would fit the bill between my Grits and my Inov-8’s which are great for technical stuff, but not so great for really long runs. These are the Cascadia 7 which is last season’s model which is also why I was able to buy them half price from sportsshoes.com. My first thought upon putting them on was that these were a solid pair of shoes. They look and feel substantial. They also feel comfortable straight off. The upper is soft and stretchy and on these shoes the asymmetric lacing seems to work for me. The toe box feels wide and roomy. I took them out for a quick run through the woods. Mixed trail, some stones, mud, grass, gravel and a little tarmac. Overall impression is yes, this is a good shoe. The grip was good on all terrains. I was keen to find out how they felt running on sharp stones and they passed the test well. The sole gives good protection. They are a little more shoe than the Pure Grit so they are not quite as responsive, but they offset this by being very stable and well protected. These are the sort of shoes you could wear for an ultra over hard terrain. Having only worn them once, I am already thinking that I might wear them for the second half of the West Highland Way Race which is over stony ground and which has been hurting the soles of my feet when running in my Pure Grits. In summary these feel like a comfortable, stable, well protected shoe which I expect to be well suited to long steady miles. These were a little bit of an indulgence. As they were only £35 or so in a sale, I thought I would give them a try. I had previously tried on a pair of these a few years ago and at that time immediately felt they were way too lightweight for my larger frame. Over time I have become a wee bit lighter and have also transitioned to lower drop shoes so I was pleasantly surprised when I laced these up just how comfortable they felt. They are little more than some soft fabric attached to a sole, but that makes them very comfortable to wear. The fit is snug and really nice and the asymmetric lacing again works and holds the foot in place nicely. They are incredibly light, but the sole is more robust that I expected. I already have both Green Silence and Pure Connect shoes. This feels like a more structured shoe than the Green Silence and also has a much more comfortable upper and lacing system. I think that the Pure Connect has a more cushioning and the T7 doesn’t roll you on to your forefoot in the way that the Connect does. It feels like a slightly wider fitting shoe than the Connect as well. For me the T7 felt immediately more comfortable and better suited to my foot than either the Green Silence or the Pure Connect. I wore these for a quick treadmill 5K at lunchtime and was very happy with them. I don’t know how long they will last, but I look forward to trying them out in some 5K and 10K races.